Industry weakness has slowed the steakhouse down, but business took a turn for the better in the first quarter. On May 1, Texas Roadhouse (NASDAQ:TXRH) released earnings for the first quarter of 2017. The last few reports didn't do much to inspire Wall Street, and the broad restaurant industry has been under significant pressure. However, the Lone Star-inspired steakhouse outperformed during the first three months of 2017 -- here are three key highlights from the quarterly results. For the past year, U.S. restaurants have been getting clobbered. New openings have outpaced demand for eating, and as a result, average comparable sales are down. Chart by author. Data source: TDn2K. The casual-dining segment, in which Texas Roadhouse operates, has been one of the worst performing, as consumers have favored fast food and fine dining. Though the middle market is getting squeezed, the chain is holding its own and outperforming the national average for foot traffic and ticket size. Chart by author. Data source: Texas Roadhouse quarterly reports. Comparable sales growth slowed as 2016 wore on but rebounded strongly to kick off the New Year. What has been the company's recipe for success? It's winning over diners with its value proposition of large portions at a fair price and a fun-loving atmosphere. Management said that, eight weeks into the second quarter, comparable sales are up another 2.4%. Though the industry is struggling, Texas Roadhouse continues to outperform many of its peers. That's great news for shareholders as it signifies that market share is being stolen away from the competition. During the previous quarter, management laid out plans for about 30 more store openings, a 6% increase in restaurant count. Included in the 30 will be six Bubba's 33 locations, nearly doubling the total number of locations for the company's new sports-bar concept. Year to date, six Texas Roadhouses have opened their doors, and management reaffirmed its previous building pipeline guidance. As a result of the openings and the comparable sales increase, revenue was up 10.2% from last year. Also in the outlook for 2017 is food deflation of 1% to 2% and the challenge of rising labor costs, which Texas Roadhouse has experienced so far this year. The falling cost of food should help offset those expenses, though, leaving comparable sales as the main component affecting the bottom line. All of that top line growth has translated into a steadily growing bottom line, too. Earnings per share increased 19% last year, although 2016 ended with a dud, with a 9% year-over-year decline. Much of that had to do with the aforementioned labor increases, as well as higher depreciation expense. One area of concern in this last report was another drop in profits, this time at 4.4%. Labor cost increases were again a culprit, but it's worth noting the primary cause was a one-time $14.9 million charge fighting and settling a legal dispute over hiring practices. With that now in the past, investors can rest assured the drop wasn't related to any problems with basic restaurant operations. In spite of the recent sputter, 2016 was a good enough year for management to dole out another dividend increase. 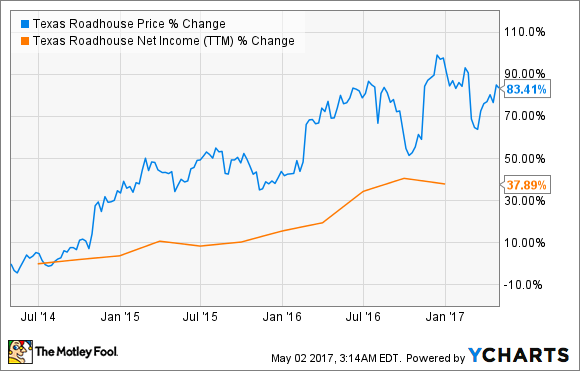 Since initiating a dividend in 2011, Texas Roadhouse has increased it every year by an average of 17%. This last raise saw the payout go up 10.5% to $0.21 per share, which works out to an annualized yield of 1.6% as of this writing. Texas Roadhouse's outlook remains positive in spite of a few hiccups. The snafu in the fourth quarter set share prices back, but investor optimism has returned with the dividend raise and encouraging results from expansion efforts over the last few years. A restaurant recession? So far, so good in 2017 for owners of this chain.